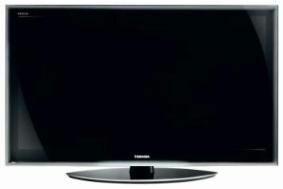 IFA NEWS: Toshiba announces its first UK LCD with LED backlighting | What Hi-Fi? The last of these measures ambient room lighting alongside the onscreen content to optimise the picture, while also offering energy consumption benefits. Active Vision M200HD uses intelligent backlight scanning to create smooth 200Hz motion flow, Toshiba says, while Resolution+ is used to enhance edge detail within standard definition images. The Regza SVs are also among the first TVs to use Dolby Volume, which normalises volumes between channels, and between programming and commercials. Four HDMI inputs are provided, along with a dedicated PC input and DLNA compatibility for the streaming of music, images or video from a suitable PC over a network, and the SVs can also play JPEG, MP3 and DivX content from USB memory keys, or pictures from SD cards. The Regza SV models go on sale this month.